Interstate 464 is a mostly six lane north-south urban connector linking Interstate 64 and Virginia 168 in Chesapeake with Interstate 264 and the Downtown Tunnel at Berkley in Norfolk. Interstate 464 connects directly to the Virginia 168 Chesapeake Expressway, which comprises a limited access facility southward to the North Carolina State Line for travelers headed to the Outer Banks. Further south, the 10.2-mile tolled Chesapeake Expressway extends the high speed route of VA 168 to North Carolina. Costing $116-million and built by the Public Private Transportation Act, construction on the limited access road broke ground on July 12, 1999.6 The expressway opened following a ceremony held on the morning of May 23, 2001. Interstate 464 extended north from Interstate 64 and SR 104 to SR in 1987. SR 337 west from I-464 spans the Southern Branch of the Elizabeth River across the tolled Jordan Bridge. A new fixed 165 foot high span replaced the original draw bridge there when it opened to traffic on October 29, 2012. Construction included the elimination of the loop ramp from I-464 south to SR 337 east. A pair of end signs stand 1.75 miles ahead of Interstate 264 along I-464 north at the cloverleaf interchange (Exits 4A/B) with Virginia 337 (Poindexter Street). I-464 ended here in 1987. Photo taken 10/12/14. Interstate 464 winds northwest across D Street, a railroad line and Halifax Street by port and industrial areas along the Elizabeth River Southern Branch to Interstate 264 (Exits 6A/B). Photo taken 10/12/14. A second pair of end signs appears for Interstate 464 at the half diamond interchange (Exit 5) with South Main Street. Photo taken 10/12/14. Exit 6A departs I-464 north well ahead of the interchange with Interstate 264. The off-ramp serves adjacent State Street and Berkley Avenue before looping into the Downtown Tunnel to Downtown Portsmouth. Photo taken 10/12/14. The northbound mainline defaults onto the Berkley Bridge and Interstate 264 east to Downtown Norfolk. An end shield is posted as two lanes merge from the Downtown Tunnel to the left. Photo taken 10/12/14. Interstate 464 crosses the Norfolk/Chesapeake city limits boundary at the D Street underpass on the half mile approach to Exit 5. This set of signs was replaced after 2008. Photo taken 12/17/01. High rises from Downtown Norfolk appear along the horizon as I-464 north reached the off-ramp (Exit 5) to South Main Street. This sign bridge was replaced with a single ground level sign for Exit 5 here after 2008. Photo taken 12/17/01. Two lanes continue onto Interstate 264 east to Downtown Norfolk as Exit 6A departed for I-264 west. This set of signs was carbon copied after 2008. Photo taken 12/27/00. Exit 6A splits with a ramp to parallel State Street and Berkley Avenue to adjacent shipbuilding facilities. This ramp must be taken by any hazardous materials carrying vehicles which are prohibited from the Downtown Tunnel. Photo taken 12/17/01. Crossing the Berkley Bridge across the Eastern Branch of the Elizabeth River, four lanes of Interstate 264 west will split with a two-lane off-ramp (Exit 8) to I-464 south. This set of signs was replaced by 2012. Photo taken 03/01. Interstate 264 westbound at the split with Interstate 464 south to the city of Chesapeake. The inspection station to the left is for hazmat traffic headed to the Downtown Tunnel. Photo taken 03/01. The last exit before the tolled Downtown Tunnel takes motorists along Interstate 264 east to Virginia 141 (Effingham Street) by Downtown Portsmouth. The pull through panel here is the first reference for I-464 south. Photo taken 10/12/14. An All Electronic Toll (AET) gantry precedes the I-264 eastbound descent into the Downtown Tunnel at Court Street. The two lane tunnel emerges at Exit 8 with I-464 south. Photo taken 10/12/14. Exit 8 loops away from Interstate 264 east to Interstate 464 south through the city of Chesapeake. Motorists remaining along I-264 east next span the Berkley Bridge into Downtown Norfolk. Photo taken 10/12/14. Travelers taking Exit 8 from I-264 east split onto a slip ramp joining the southbound beginning of I-464 from I-264 west or onto the Berkley Avenue off-ramp. Photo taken 10/12/14. Replaced guide signs posted on the I-464 overpasses at Exit 8 along Interstate 264 east. The advent of traffic from the ending I-464 north expands I-264 east into four overall lanes across the adjacent Berkley Bridge. Photo taken by Adam Froehlig (02/23/03). The first sign for Interstate 64 and U.S. 17 along I-464 southbound appears at the diamond interchange (Exit 2) with U.S. 13 (Military Highway). The exchange with U.S. 13 was partially open between 1967 and 1987. Photo taken 10/12/14. Campostella Road spans Interstate 464 one quarter mile north of the full cloverleaf interchange (Exits 1B/A) with I-64 and U.S. 17. Photo taken 10/12/14. Exit 1B takes motorists from I-464 south onto I-64 inner & U.S. 17 north across the high rise bridge over the Southern Branch of the Elizabeth River to Deep Creek. Photo taken 10/12/14. Interstate 64 outer circles northeastward to I-264 at Virginia Beach then northwest through Norfolk and Hampton. U.S. 17 turns south from the end of I-464 to SR 168. Photo taken 10/12/14. An end shield for Interstate 464 stands as Virginia 168 takes over along the Oak Grove Connector southeast. The freeway originally defaulted onto Virginia 104 (Dominion Boulevard) leading southwest to Great Dismal Swamp. U.S. 17 follows that route now. Photo taken 10/12/14. Traffic quickly separates from the ending Interstate 464 to U.S. 17 southwest to Elizabeth City, North Carolina and SR 168 south to Great Bridge and the tolled Chesapeake Expressway to Moyock. Construction between 2013 and 2017 upgraded U.S. 17 to limited access standards from SR 168 to SR 165 (Cedar Road). Photo taken 10/12/14. The previous end shield posted for Interstate 464 south. Prior to 2002, U.S. 17 ran south from Deep Creek to Dominion Boulevard independent of I-64 and I-464. Photo taken by Adam Froehlig (02/23/03). The Oak Grove Connector angles northwest from SR 168 Business (Battlefield Boulevard) to directly tie SR 168 in with I-64 (Hampton Roads Beltway) and I-464 north to Downtown Norfolk. Photo taken 10/12/14. Exit 15A departs ahead of a trumpet style interchange with U.S. 17 (Dominion Boulevard) for I-64 outer & SR 168 north. SR 168 dog legs east along I-64 to Battlefield Boulevard at Exit 290. Photo taken 10/12/14. Exit 15B consists of a loop ramp circling back to the southwest for U.S. 17 (Dominion Boulevard) to South Deep Creek. Construction between 2013 and 2017 upgraded Dominion Boulevard to an expressway southwest to Virginia 165 (Cedar Road). Photo taken 10/12/14. A left side entrance ramp brings U.S. 17 north as Interstate 464 begins. U.S. 17 briefly overlaps with I-464 to make the connection with I-64 inner west to Deep Creek. Photo taken 10/12/14. A cloverleaf ramp takes U.S. 17 north onto Interstate 64 inner (west) toward Suffolk. I-64 ends at Bowers Hill in 8.4 miles. Photo taken 10/12/14. U.S. 17 was realigned onto Dominion Boulevard leading northeast from the Great Dismal Swamp in Winter 2002. 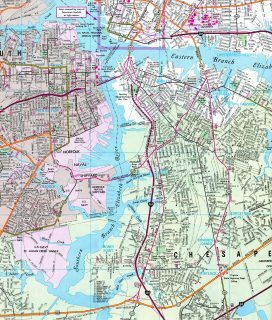 This was done as part of an overall realignment from North Carolina through west Chesapeake. The relocation overtook former Virginia 104, signed here via Exit 15B. Photo taken 03/01. When the Oak Grove Connector freeway extended Virginia 168 northward to directly tie into Interstate 464, a new interchange with Virginia 104 was constructed. Photo taken by Tony Payne (04/00). The exit numbering system for I-464 commences at the exchange with I-64. Pictured here are guide signs posted before the 2002 relocation of U.S. 17. Photo taken 12/27/00. Replaced overhead assembly posted at the off-ramp (Exit 291A) for Interstate 464 north on I-64 west of Battlefield Boulevard. I-464 connects Downtown Norfolk with central areas of Chesapeake and the area of Great Bridge of south. Photo taken 01/06/01. A new sign bridge replaced this overhead on the Great Bridge Road (SR 190) overpass in 2011. A collector distributor roadway departs ahead for SR 168 south to Great Bridge, I-464 north to Norfolk and SR 168 Business (Battlefield Boulevard). Vidcap taken 01/01. Construction in 2007 extended the c/d roadway from Interstate 464 east to Virginia 168 Business (Battlefield Boulevard). This resulted in sign changes for Exits 291 and 290. Vidcap taken 01/01. This set of overheads was replaced during construction to expand the two-lane c/d roadway to Exits 290B/A. 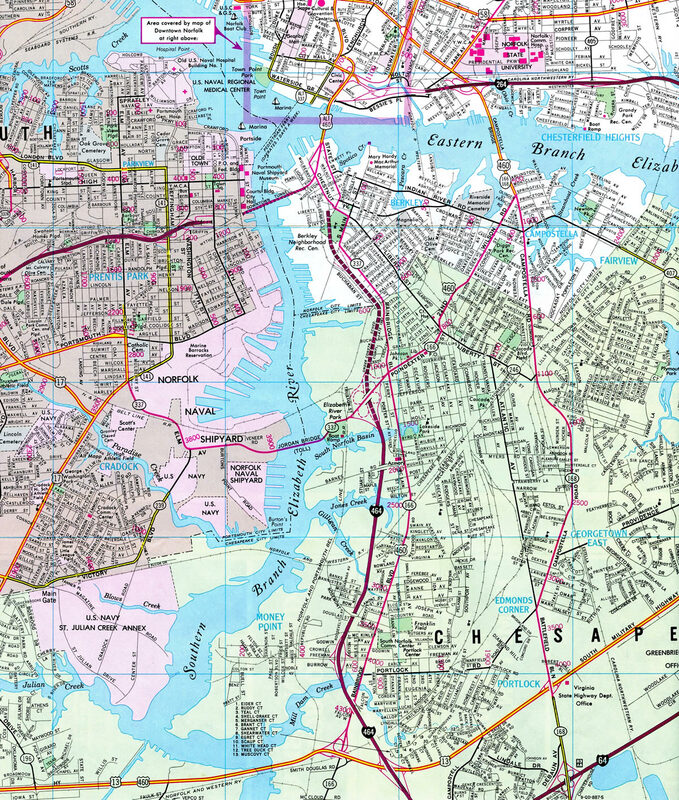 I-464 runs north parallel to the Southern Branch of the Elizabeth River through Portlock and Avalon to Berkley in Norfolk. Photo taken by Jonathan Lebowitz (08/02). “OLD SPAN’S CLOSE MAY BRING NEW CONFUSION.” Virginian-Pilot, The (Norfolk, VA), October 19, 1990. “JOY IN CHESAPEAKE AS SOUTHBOUND LANES OF ROAD SET TO OPEN \ COMPLETED HIGHWAY IS EXPECTED TO TAKE 30 PERCENT OF TRAFFIC FROM BUSY BATTLEFIELD.” Virginian-Pilot, The (Norfolk, VA), July 20, 1999. “BATTLEFIELD BOULEVARD TO GET RELIEF AFTER 30 YEARS, ROUTE 168 BYPASS GROUND BREAKING IS TODAY.” Virginian-Pilot, The (Norfolk, VA), July 12, 1999.